Internals of Billy Bass. The white square contains all the motors with the 3 sets of motor wires coming out. The battery pack which we use as a power source can be seen on the back plate. Billy Bass PCB with some of the wires cut. You can cut this piece completely free, but I hadn't committed to that when I took this photo. The positive wire coming off the power source being connected to the back switch. 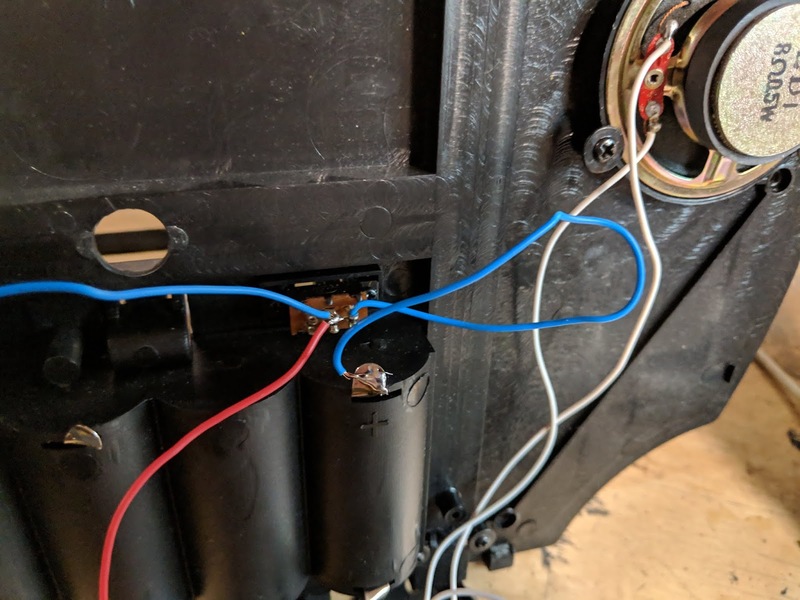 The switch now turns the motors on and off by enabling and disabling the power. Echo Dot disassembled. The green PCBs connected by the ribbon cable are all we need. You can re-assemble the empty Dot case and gift it to a friend. 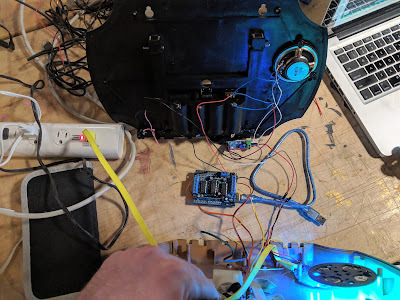 Arduino and Echo Dot connected to the LM386 amplifier board and internal Billy Bass Speaker. Note the white signal cable from the amplifier speaker wire terminal running to the Analog input on the Arduino. All the components connected and working, but not yet re-assembled into a coherent fish. On the top you can see the front plate. I used the plastic risers on Billy's case to hot glue the lower PCB, and then screw the other half right above. On the bottom you can see the amplifier which was simply glued to the back plate. I later ended up moving it to the left side so it did not pickup interference from the speaker being driven. Drilling holes so Alexa can hear with the case closed. Hope you enjoyed the write up, and good luck hacking! As always I will try to provide technical support in the comments, so please let me know if you have any trouble following. Your sketch is somehow broken. Is it? I thought I copy pasted verbatim from what I was running... Can you share your error message? Both files have same content. Something went wrong. See bottom of the page for link to the current gen BMBB product available with Alexa support built-in. Hey Alan, yes there is a pre-built bluetooth Billy you can buy that makes a cool toy. This post is for those who subscribe the the whole "it's about the journey not the destination" mantra when it comes to animatronic toys endowed with a smart assistant.